Born and raised in the uniquely homogenous Cajun culture of Louisiana, Abby has always enjoyed learning about diverse cultures- particularly working with refugees resettled in Baton Rouge. After many years of advocacy with the National Alopecia Areata Foundation, she intended to pursue a career in politics. However, her sense of spontaneity and adventure led her to Chandigarh, India to study Punjabi in 2014. 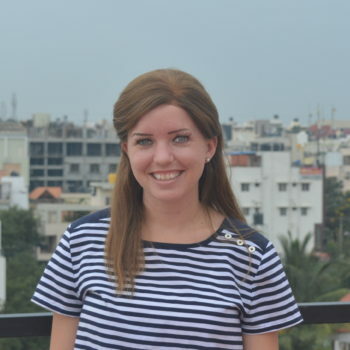 Following her studies, Abby taught English in an Indian government school in Delhi. Prior to working with Amani, Abby was an AIF Clinton Fellow at Reaching Hand, an NGO in Bangalore, working in skills training with adults. Her past experiences in lobbying, fundraising, and working, for the U.S. Congress coupled with her experience working in India have taught her the values of patience and collaboration in order to create positive change. Abby holds a Bachelor’s of Science in Political Science with a minor in Social Work from Texas Christian University. In addition to studying in Texas and India, she also spent a semester in both Senegal and Washington, DC. In her free time, she enjoys reading memoirs and running in road races.